Many Mac users take advantage of multiple displays—I personally use two, and Rob Griffiths uses even more. But while a multiple-monitor setup can significantly improve your productivity, it comes with a few challenges, the most notable being menu access: Since Mac OS X allows the menu bar to exist only on the primary display, if you’re working on a second display, you must mouse all the way back over to the main display to access system and program menus. For years, Rob and I have worked around this limitation using DejaMenu, a utility that puts menu-bar menus under the cursor. But among multiple-display aficionados, the most frequent request I’ve heard—by a large margin—is for a way to display the menu bar on both displays. SecondBar, still in early development, is the first successful attempt I’ve seen at replicating the menu bar across displays. Just launch this program and your menu bar magically appears on your second screen. (Sorry, Rob, it doesn’t currently work with three or more displays, although such a feature is in the works.) You can thus access menu commands from either menu bar. Via SecondBar’s preferences, you can set the transparency of the second menu bar, and you can make the second menu bar movable (although I’m not sure why you’d want to move it lower on the screen). 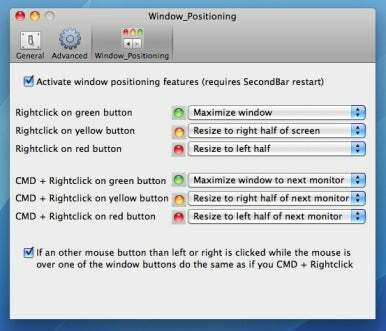 SecondBar also provides some useful keyboard and mouse-button shortcuts for quickly moving windows between displays and resizing windows to the left or right half of a display. As I mentioned, SecondBar is still in early development, so it does have some glitches. For example, it doesn’t work with all programs, menu extras—those useful menus on the right-hand side of the menu bar—don’t appear on the second display, and I sometimes had to switch away from a program and then back to it to get its menus to appear on my second display. There’s also currently no documentation, so you’ll have to play around with some of the settings and options to discover your preferred behaviors. Nevertheless, if you’ve been looking for a way to get your menu bar on both your displays, SecondBar is a promising prospect.